The Wearing of the Green song recounts the ridiculous lengths the British are prepared to go to in a desperate attempt to suppress Irish nationalism in the 18th and 19th centuries.This was largely because it was the colour of the shamrock, which carried huge significance as it was supposedly used by St Patrick to explain the mystery of the Trinity.The colour green had already had a symbolic significance in Ireland by that time. It was only a small step to imbue the colour green with the same associations.The shamrock emerged as more than a religious emblem in the early 18th century. It came to be seen as symbol of Ireland and by extension, a symbol of Irish nationalism and independence.In the early 18th century, Irish patriots started wearing green ribbons to show their support for Irish nationalism.Towards the end of the 18th century, the rebel organisation, the United Irishmen adopted green as their official colour. The British authorities are keen to stamp out any displays of Irish identity and independence. They see the colour green as a dangerous symbol that could rally Irish nationalist fervour. They banned people from wearing green as an open symbol of their Irish identity. Irish newspapers published notices stating that wearing such items as green ribbons or handkerchiefs as “an emblem of affection to Ireland” were forbidden. To wear such items would and still do, “subject a man or woman to imprisonment, transportation, the rope or the bayonet, and expose women to the brutal insults of the common soldiery”. 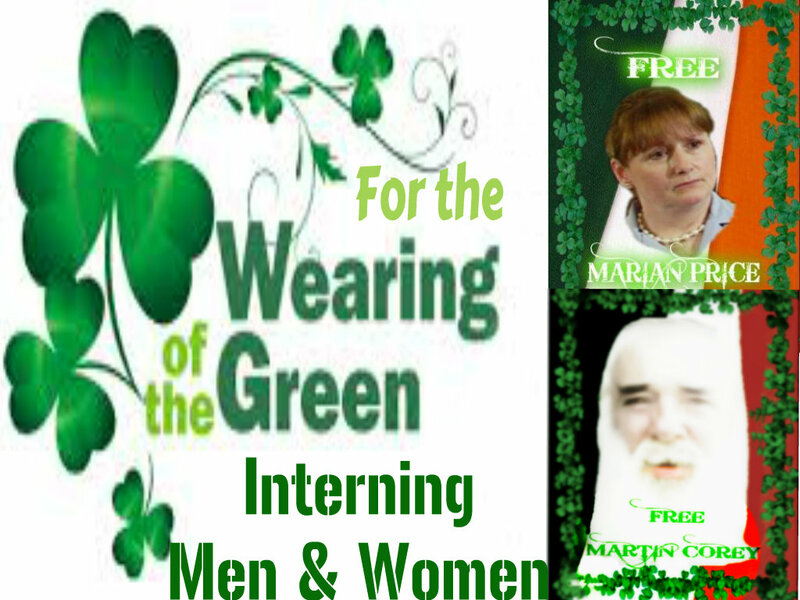 On St Patricks Day 2013, Marian Price and Martin Corey are currently interned almost two and three years respectively, without trial contrary to all domestic and international human rights standards. The only reason so far given that is that both are a "security risk" citing allegations that they are dissident republicans. Their legal team have described this "evidence" as "closed material". 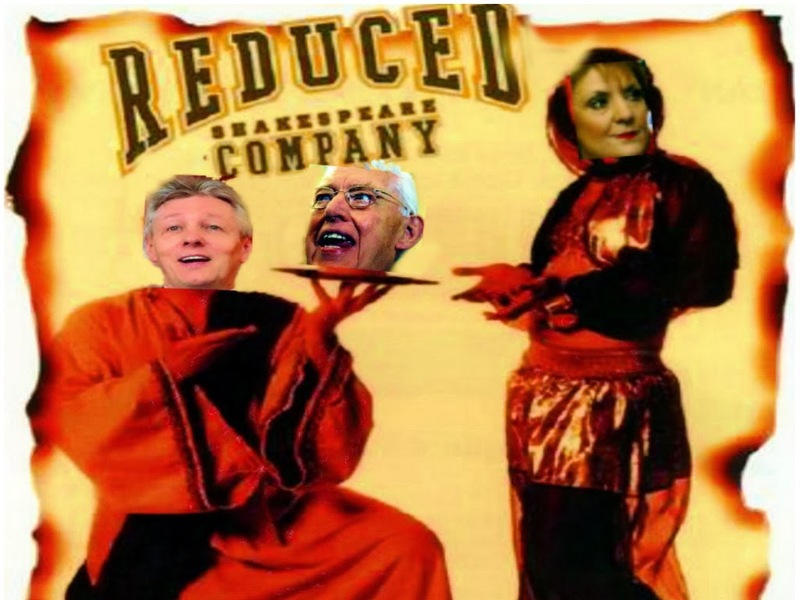 The secrecy surrounding the reasons, lack detail on any evidence. They are in essence as former political prisoners, prior peace process being made an example of. There 3 principal celebrations every year that real Irish people participate which includes Government ministers of Ireland since foundation of the southern free state. They are traditional St Patrick's Day parades, Easter parades and Bodenstown. Apparently Martin Corey and Marian Price were photographed by the British at one of these ceremonies. Marian spontaneously held up a piece of paper, because of a gust of wind, while she was unaware of the contents. Martin Corey apparently wore a green tie at one commemoration in Bodenstown. These are hardly offences where two elderly people should die interned, if the British government have their way. Without your help they will die simply being made an example of to anyone who dares wear green or challenge British occupation or brutal repression in Ireland. The move was seen by the Irish as both outrageous and ridiculous in equal measure. The song The Wearing of the Green captures both those emotions perfectly. The opening verse conjures up the sense of absurdity with the line “the shamrock is forbid by law to grow on Irish ground”. The song mocks the British for thinking they could pass a law that would stop shamrock growing or green appearing. Though ridiculous, the ban is dangerous because the British are still prepared to be brutal to enforce it. As the song’s refrain says: “They’re hanging men and women for the Wearing of the Green”.Napper Tandy who is referred to in the song, was an Irish rebel leader at the time of the 1798 Rebellion. He was exiled following the failure of the rebellion and died in France in 1803. The Irish saw attempts to ban the wearing of the green as being completely futile. Obviously, they will never be able to do that and by the same token they will never be able to suppress Irish nationalism and the wearing of the green.That’s why the singer asserts that he will continue to wear green in his caibin (pronounced cawbeen) until such time as the British can show that their law can prevent the grass from growing. Despite the best efforts of the British, they never could and never did prevent Irish people from expressing their identity by wearing green.If anything, they make the wearing of the green more popular than ever. Even today, it is still closely associated with Ireland, as can be seen by the way millions of people who wear green hats, t shirts and emblems every year to celebrate St Patrick’s Day.